oh now it comes up. Ya I wanna see what the next 6 he step is. Tt skips 24 hrs and its gone. 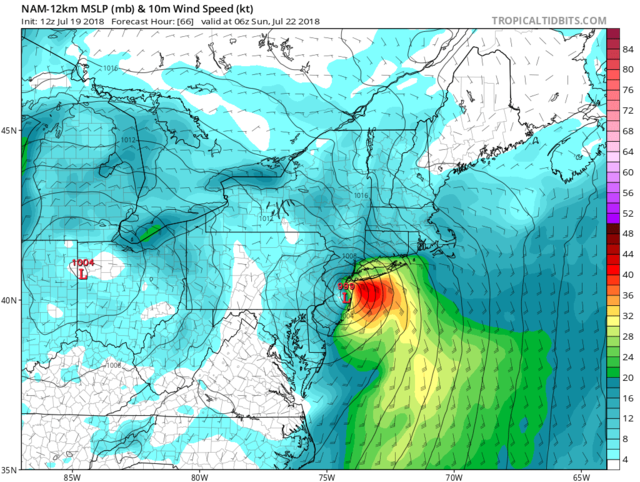 We may well have a ts if euro and gfs are right. Nhc says nothing in 5 day so I dunno. 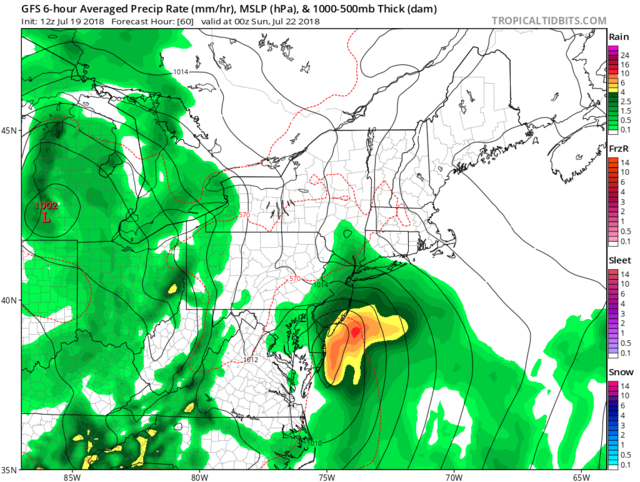 okay bout time we had some excitement for this time of year lets see what happens I imagine nhc would put up a spot by Fri.
Stay tuned Frank. It very well might get cancelled. How big of a boat is it and what are you fishing for? sroc4 wrote: How big of a boat is it and what are you fishing for? sroc any new thoughts on this? Looks like models are showing a fairly developed l.p.. Not extremely strong by any means but maybe it will b enough to warrant ts advisories? Remember it can b hybrid and still get ad isories since they changed things after sandy. 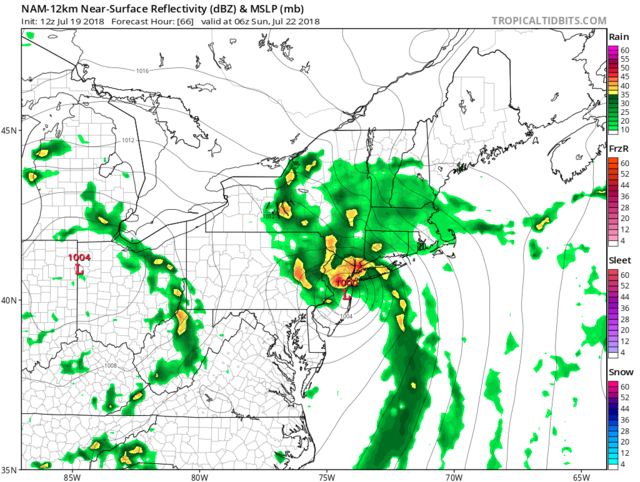 Btw this current possible storm has nothing to do with that just meant the changes the nws made to criteria. The timing and placement of the trough look to capture the energy and keep it in tight over land. While it may develop some true tropical characteristics I’m not sure it ends up being more than a phased system not too dissimilar to a good winter storm. 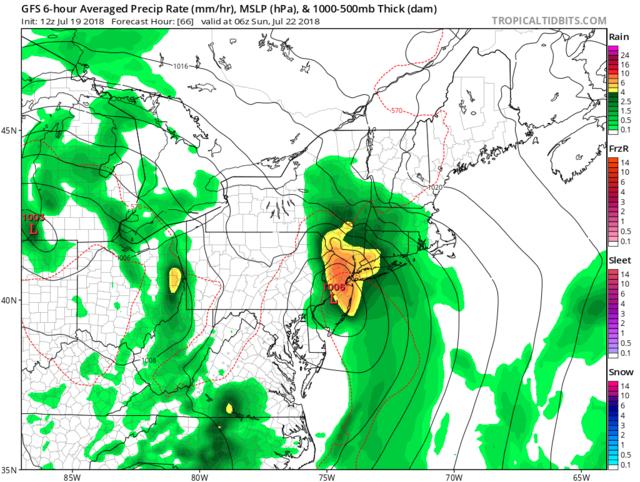 If this were winter Doc and CP and the NW CREW WOULD HAVE THE BEST SHOT at big snow. Models are still trying to figure out placement of the low and where the best convection will be. Still time to iron things out. Hey skins. Since this really isn't going to be a true tropical system keep the discussion in the other thread. sroc4 wrote: Hey skins. Since this really isn't going to be a true tropical system keep the discussion in the other thread. Looks like NOAA has lowered their predictions for named storms. I would imagine that with all the hot and humid weather we have been having,the water must be pretty warm though. Our hurricane season usually gets more active in Sept. and Oct.,no? GreyBeard wrote: Looks like NOAA has lowered their predictions for named storms. I would imagine that with all the hot and humid weather we have been having,the water must be pretty warm though. Our hurricane season usually gets more active in Sept. and Oct.,no? 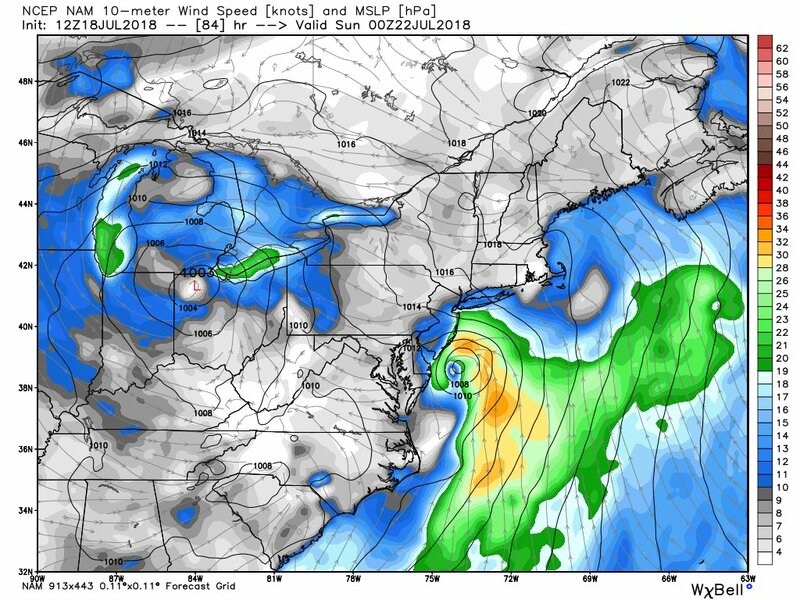 After seeing the low prediction and being we are at F already (two systems developed in a odd place northern at lantic and Europe got a subtropical storm last weekend) I'm thinking if we do get anything interesting to track its going to b one maybe 2 storms. Frank did mention the area was more favorable for a track this way but as Al said there's a bit of a hindrance there. Maybe when frank said that it wasn't there. Anyways I may not even b surprised if we have a record low season this year with under 10 named and no majors. I cannot spend much time at all posting right now, but for those of you whom have access, check out the EURO Ensembles and reference Part 2 of my most recent video update, posted in the observation thread a couple pages before the most recent. 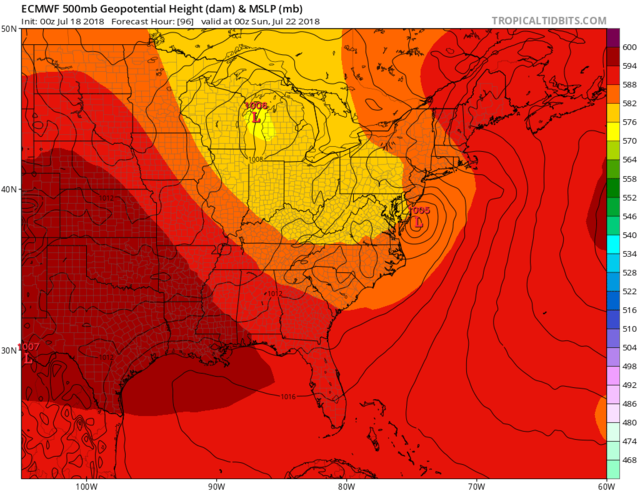 As it stands now, the EURO Ensembles are at least showing that my ideas have merit so far. All I can ask for, but I think things are going to come alive, folks Again, I will not be able to post much for a few days, and will be on "limited capacity" for this week as I will be on vacation, but I will try to check in to respond to any questions/comments! rb924119 wrote: I cannot spend much time at all posting right now, but for those of you whom have access, check out the EURO Ensembles and reference Part 2 of my most recent video update, posted in the observation thread a couple pages before the most recent. As it stands now, the EURO Ensembles are at least showing that my ideas have merit so far. All I can ask for, but I think things are going to come alive, folks Again, I will not be able to post much for a few days, and will be on "limited capacity" for this week as I will be on vacation, but I will try to check in to respond to any questions/comments! Whats up Ray. First off I hope your having a great summer! A few comments on your video. The neg burst in the SOI and the current trough in the east is pretty much right on target from your video, approx.9days from the last of the consistently deep neg values. Ironically though in the video you point out the ridging coming back around the 24th. The trough was about 2-3days later than what you had said in the video, but at that lead time the idea regarding the SOI telegraphing the trough in the 7-10day was spot on. The MJO; however, has yet to emerge out of the Null phases and while current forecasts still have the possible emergence of it out in phase 4-5, the MJO forecasts have been wonky as of late. My issue is for at least the next 2 weeks the Atlantic and great smokies heat ridge complexes will dominate the eastern half of the country still. The trough complex looks to fall back to west. While I can see pieces of the trough in the west breaking off and scooting along the N periphery of the ridge and causing temporary weakness in said ridge complex along th EC region the 200mb VV forecasts do not appear to be very favorable for Trop development....yet. When a pattern has been well established I always find it takes much longer to break it down than modeling might otherwise indicate. I think its the middle to second half of Sept is when we really see the Trop Atlantic come to life, at least temporarilly. Im not saying nothing(sorry double negative) will develop before then I just don't think it becomes all that significant until then. We need something to really trigger a large scale pattern shift. Maybe these two sister typhoons currently recurving N over and near Japan will trigger the shift sooner rather than later; once their energy gets caught up into the polar westerlies we see shifting in the modeling as well. Until then; however, I think we remain quite. This is just my humble opinion of course. I have a friend who is in Hawaii on vacation!!!!!!! weatherwatchermom wrote: I have a friend who is in Hawaii on vacation!!!!!!! My friend just came back last weekend.. close call!Can't imagine what they are going through..
31 inches or rain and rising!! Holy smokes, just heard this about Hawaii. What caused the strange track of the hurricane to hook due north, I do not think I have ever seen that. I am guessing this is a pretty rare occurrence for Hawaii?